Playing with a favorite toy, learning a new skill, finding one’s place in the family and in the world—these common childhood experiences shape a person’s development and help define his or her identity. The treasures in this case, cherished by children of different times and places, reflect various ideas about what it has meant to grow up American. 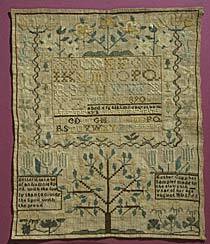 For young girls in early America, needlework was not a hobby but a necessary skill they were expected to master along with other domestic duties. This is one of the earliest teddy bears, created by a Brooklyn candy store owner who went on to form the Ideal Novelty and Toy Company. Named after a president and inspired by an editorial cartoon, this beloved childhood companion has a political history all its own. In 1902, Washington Post cartoonist Clifford Berryman depicted President Theodore Roosevelt refusing to shoot a captured bear offered up as a hunting trophy. 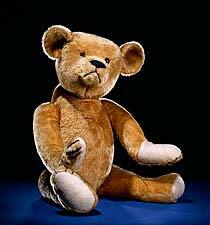 The bear became a regular figure in Berryman’s cartoons, serving as a fuzzy, cuddly foil for the brawny president. 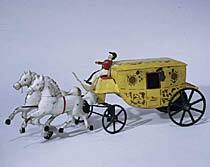 This jaunty horse-drawn carriage was presented to a little girl in Washington, D.C., during the Civil War. When wound with a key, a clockwork mechanism inside the toy turns the back wheels and sends the carriage on its way. The Connecticut manufacturer, George W. Brown & Co., was famous for producing a variety of windup tin toys during the mid-1800s. Ng Shee Lee, a Chinese immigrant living in New York’s Chinatown, made this silk bonnet for her American-born son Peter. Caps like this one are traditionally worn by Chinese boys after their first birthday. 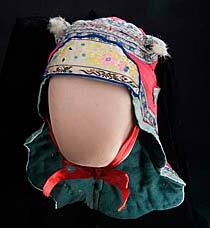 With its furry ears, the bonnet is meant to resemble the head of a dog, a disguise to protect the child from evil spirits.